As a person who once had the walls in my family room covered with framed photographs of the Universal Monsters, I was thrilled to see (not one, but TWO) books devoted to werewolves. Vampires and zombies are everywhere, but werewolves? You had to search hard to find them…until now. Lycanthropy is one of the oldest legends of human monsters in recorded history. In my opinion, it is one of the most fascinating because unlike vampires who only come out at night, werewolves can be your neighbor, your friend; even your relative…and you wouldn’t know it because they behave normally for most of the month. That makes for a nasty surprise when they don’t behave normally, come the full moon. 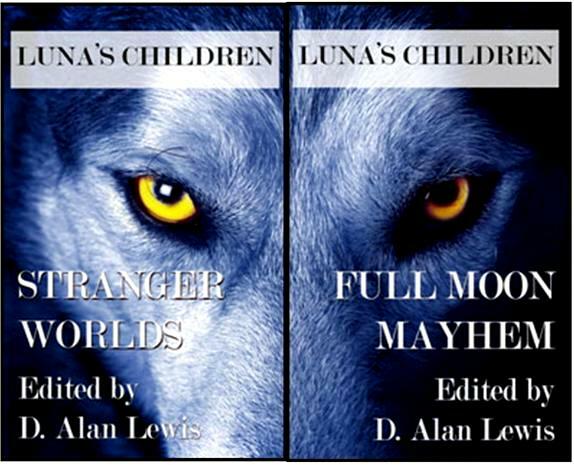 Luna’s Children, edited by D. Allen Lewis, contains twists to the legends, because many of the stories in these two anthologies are looking from a wolf’s point of view. So we not only have traditional legends of changelings, but also full-time wolves. Luna’s Children is a two-book pair consisting of Full Moon Mayhem and Stranger Worlds. Since I cannot review every single story, I will highlight my favorites from both volumes. “Truth or Darren” by Angela Bodine is a clever title, and it contains the truth or dare game. “Is it true that I’m holding a knife?” Ina creates psychological terror for Darren, who is already dealing with his own issues when he sees his altered reflection in a creek. I like this story for its originality. Luke Woodard’s “Sheep in Wolves’ Clothing” contains authentic, snappy dialogue as Malachi Swift, who specializes in metaphysical speculation, investigates an evil that occurs in a place where only good is supposed to be. This story is very well written, containing exciting suspense and a satisfying ending. I like “The Sponsor” by J. M. Perkins because it is a humorous take on a twelve-step program. If you didn’t want to be a werewolf, would you seek therapy? A very enjoyable read. In contrast, “Newborn” by Mike Rhodes is a deliciously gruesome tale that is graced with descriptive prose and is a real grabber. “Eagle and Wolf” by Brad Ellison opens this collection with an exotic feel, as it takes place on the Rhine River. Even the timeperiod is exotic; it is back when Centurians marched in the Germanic country. In this story, the soldiers meet an enemy they cannot expect, nor understand. I especially like “Bad Blood and Old Silver” by Christopher L. Smith because this one is a more traditional take on the werewolf legend. I applaud Smith for starting with ravaged calves and then bringing the monster to start stalking the humans. A good, old-fashioned and very scary tale. Blaise Torrance’s “All that Glitters” is probably the very best story out of both volumes. 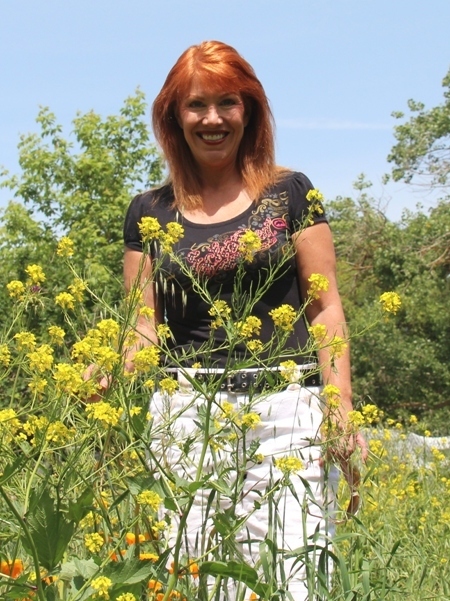 Tess is suffering from a fever; is she turning or is it just a regular illness? Meanwhile, only a body of water separates her from the others who have already turned. This is an emotionally raw, frightening story, and Torrance writes with florid talent. I believe we will hear more from Blaise Torrance in the future, and I have confidence that it will be all good things. All in all, this two-volume set (you can buy them separately as well) of Luna’s Children is a joy for werewolf lovers everywhere. 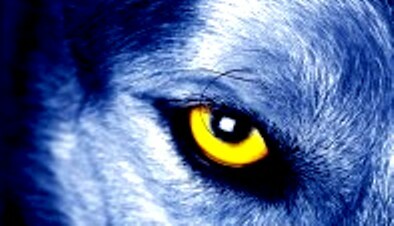 It is about time that werewolves got their due. And since Luna’s Children is a two-volume set, it is double the pleasure. In 1965, an object fell from space, somewhere near Kecksburg, PA. This was the same year that Alan was born. To date, no connection has been made between the two events but that hasn’t stopped the conspiracy theorists and his family from speculating, D. Alan Lewis is an ‘alleged’ native of Chattanooga, Tennessee who now resides in Nashville with his children. 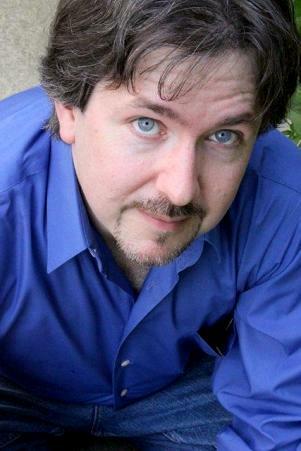 He is an author of steampunk, sf & f, pulp, and horror stories and novels. He also is a frequent speaker/panelist at conventions around the Southeast. In 2006, Alan took the reins of the NWMG’s Novelist Group where he works with new and aspiring writers, leads writing and publishing workshops, and has worked to publish the NWMG’s 4 anthologies. Alan’s debut novel, a fantasy murder mystery, The Blood in Snowflake Garden was a finalist for the 2010 Claymore Award. Alan’s other books include the steampunk novel, The Lightning Bolts of Zeus from Dark Oak as well as The Bishop of Port Victoria from Pro Se Press. He is editor of the Dark Oak Press’ anthologies, Capes & Clockwork: Superheroes in the Age of Steam, Luna’s Children: Full Moon Mayhem and Luna’s Children: Stranger Worlds. He also has short stories in over a dozen anthologies, including Dreams of Steam 4-Gizmos, Black Pulp, Nashville Noir, Beyond the Skyline, Comfort Foods, Pulpology, High Adventure History, and Midnight Movie Creature Feature Vol.2.